The OSGB created an attractive display at the Congress, alongside orchid societies from around the country and traders from around the world. Many thanks to all the members who lent their plants for the display and to Val Micklewright and Simon Waddilove who were instrumental in its creation. Tony Britton, Chairman of the Cumbria OS, took the trouble to bring along his unusual Cycnoches (warszewiczii x barthorium) which had timed its flowering perfectly to coincide with the Congress and was a great feature on our display. This involved packing it with the greatest care for travel on two trains followed by a car journey. Where there is a will, there is a way! Val Micklewright's Phragmipedium besseae was covered in flowers and won 1st Place for a Phragmipedium species, along with her Phragmipedium schlimii and one of Michael McIllmurray's maxillarias which both won 2nd place rosettes in their classes. The pupils, parents and staff of Writhlington School, led by Simon Pugh-Jones, offered visitors a warm welcome, super hospitality and a wonderful Congress. The lecture programme was varied and well attended by beginners and expert growers alike. Congratulations and thanks to everyone involved. The OSGB is co-ordinating a visit to Burnham Nurseries on Saturday 24 November 2012. This is by kind invitation of Sara Rittershausen who has offered to provide lunch in Burnham’s excellent coffee shop as well as entry to their beautiful display house, Orchid Paradise, free for OSGB visitors. Members around the country will need to make their own arrangements/bookings for travel. However, a group will be travelling from London Paddington to Newton Abbott station and members may join this group if they wish. Taxi/minibus transfer between Newton Abbott station and Burnham Nurseries (2 miles) will be paid for by the OSGB. Congress lectures are free to registrants and cost £1 each for day visitors, except for beginners talks marked * that are free entry for all. Please note the change of date for the South East Orchid Society's Open Autumn Show. It will now be held on Sunday 21 October (not 28 October as previously published), 14:00 - 16:00. The venue remains the same: Ashford Rail Staff Hall, Beaver Road, Ashford, Kent, TN23 7RR. The RHS London Orchid And Botanical Art Show dates for 2013 have been confirmed as 12-13 April (RHS members £5, non-members £8). A preview evening will be held on 11 April (£12). The show will be held as usual at the Royal Horticultural Halls. The show will feature orchid displays from the finest British and international growers; tropical and hardy orchid species and hybrids to suit all budgets; lectures from experts on orchid cultivation; and stunning examples of botanical art. The OSGB will be exhibiting at the show; please save the date to visit the show or to help in some way with the display. 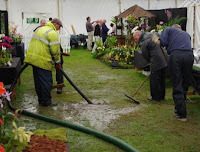 To book visit www.rhs.org.uk/londonshows or telephone 0845 612 1253. The Society gained a Silver-Gilt medal for its display at the Peterborough International Orchid Show last weekend. The exhibit featured a plant hunter's field camp, with a hut set amongst orchids exhibited in a naturalistic setting. Against the back of the display was a cliff face of moss and cork bark covered in colourful Phalaenopsis hybrids, moss and ferns. A small valley of ferns and bark added interest between the cliff and the mound in front of it. The hut was decorated with white Phalaenopsis and blue Vanda draped in Spanish moss. To the left of the hut was an impressive collection of Anguloa, and to the right a colourful group of Phragmipedium. To the front of the display was a mossy mound covered with a wide variety of smaller-flowered species, including Aerides; Angraecum; Disa; Encyclia; Maxillaria; Oncidium; and Prosthechea. The weather proved a challenge throughout the weekend, with floodwater lapping at the base of the display on Friday and threatening to submerge a group of Paphiopedilum, before being pumped out by showground staff. Congratulations to Val Micklewright and all the team who created the delightful and interesting display. Please remember that there will be no meeting at Napier Hall on Saturday 7 July. The meeting will be held on Saturday 14 July instead, to avoid clashing with the Peterborough Interenational Orchid Show (6-8 July). The speaker on 14 July will be Michael McIllmurray talking about the OSGB trip to Ecuador. 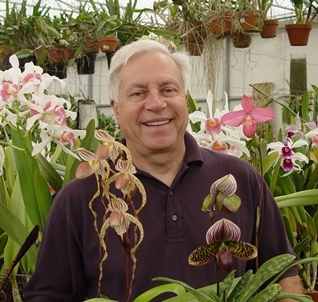 Jerry Lee Fischer of Orchids Limited, Minnesota, USA, will be speaking to three orchid societies this autumn when he visits to UK to attend the 25th BOC Congress at Writhlington School. His visit is sponsored by the British Orchid Council and all three societies have offered to open these meetings to members of any society that is affiliated to the BOC. Jerry will be bringing with him pre-orders for delivery, along with a small selection of plants for sale. Pre-ordering is available now, until 15 August, details below. To all our UK customers, from Jerry Lee Fischer, President, Orchids Limited, USA. 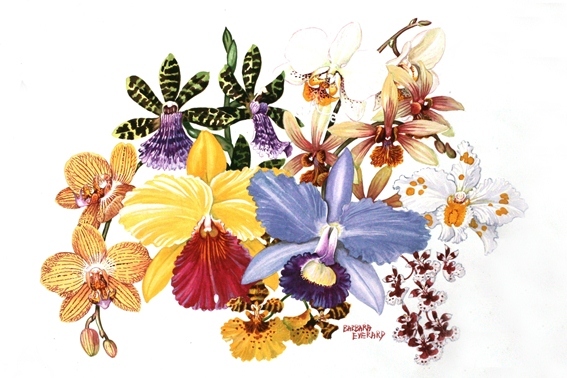 Orders can be placed via our website: http://www.orchidweb.com/ Scroll down to Orchid Events and click on the October 2012, Great Britain Tour. I will also bring a limited number of selected plants for sale at each meeting. The deadline for placing orders is 15 August 2012. Please note: No changes can be made to orders after August 15th, as we must begin preparing the required documents. It takes several weeks to process the paperwork for an October departure. When placing your order via our website, please select only plants from these 5 genus that are noted as ‘CITES-approved for export’. We have added many new products since our last offering. You can see these new products by going to the ‘Advanced’ search on our website and looking in ‘Added to Inventory in’ link and choosing the ‘last 6 months’ option. The items will then be listed from the oldest added to the newest. They are not listed alphabetically or by category. Once your order has been reviewed and finalized, payment is due in full to hold your order. Payment must be made in US dollars via credit card (American Express, Visa, MasterCard or Discover) or PayPal. Wire transfer is no longer an option unless your order is over US$1,000. There is no minimum order for pickup at the Society meetings. The minimum order for shipping within the UK is US$100, shipped to one address. If picking up your order, an additional 20% will be added to your order to cover document processing fees (5 genus fees, CITES permits, import permit, phytosanitary certificate, baggage fees). The fee for those orders being shipped within the UK is 25%. This covers the actual ship cost. One exception will be the shipping of extra-large plants such as some cattleyas, as these may require extra baggage/shipping fees due to size and weight. These possible additional costs will be calculated once we have your final order and will be charged once the order is received. Your order will be shipped by Royal Mail or Parcel Force within the UK. Large orders may require shipping by FedEx or another carrier and may cost more to do so. If the plants you receive do not do well in the first 2-3 weeks, please notify us and send pictures by email, if possible. I assure you that we will replace those plants on one of our next visits. The Barbara Everard Trust for Orchid Conservation (BETOC) was set up principally to conserve old hybrid orchids in cultivation, and also to have a greenhouse run by the OSGB to conserve them. We tried the latter in the past and it was not successful, and for the former we have had very few applications over the years. Consequently we have supported greenhouse cultivation of orchid species in the UK, giving grants to National Collection holders under the Plant Heritage scheme (previously National Council for the Conservation of Plants and Gardens) to improve their collections and for equipment for their greenhouses. We have also given grants for publications concerning growing orchids in greenhouses, and for some educational grants for projects involving cultivation and conservation in cultivation. BETOC does not give grants to conservation of wild orchids growing in their habitats. From now onwards the BETOC grants and finances will appear in the OSGB Journal and Annual Supplement. A sticker is being printed for members to put in their greenhouses, which advises people to contact BETOC if the plants cannot be looked after any more. We can then arrange to collect the plants and place them with suitable growers, if a specialist collection, and with members, if general plants. So, if you or your relatives can no longer look after your orchids, BETOC will take them away and get them cared for. The visitors have been and gone, the medals awarded and the display dismantled. Such is the ephemeral nature of the Chelsea Flower Show but part of what makes it so magical. Two members' plants received Certificates of Cultural Commendation from the RHS Orchid Committee. Michael McIllmurray's Maxillaria shepheardii 'Chelsea' boasted around 300 flowers and David Martin's Cymbidium Sweet Devon 'Sweet' carried eighteen pendent spikes. The OSGB enjoyed a successful show and is delighted to welcome all those new members who joined during the week and hopes to see them at the Introductory Seminar on 4th August (contact Sam Hurley to book your place, tel: 07900 250247 or e-mail: sam@ballyhurley.com).